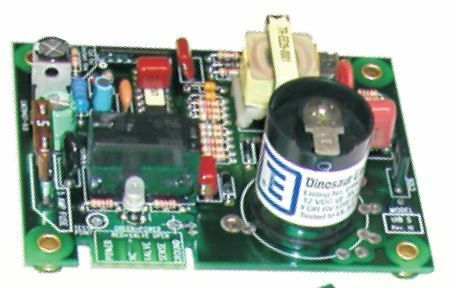 Dinosaur Electronics UIB S Universal Ignitor Boards will fit most brands of furnaces, refrigerators and water heaters. Small board with spade connector, 12VDC operating voltage. Features 3-try ignition with delay. These universal 12VDC ignitor boards are certified by Testing Engineers International to meet UL 372 & UL 353 specifications for the use in the RV industry. The UIB S, UIB S Post, UIB L and UIB L Post are all "electrically" identical but "mechanically" different for conveniet installation. These rugged boards use double sided-plated thru hole technology for added reliability. They are fused to protect the board from short circuits in the NC and Valve circuity. A two color LED monitors the NC and Valve terminals to let you know when there is power to the board - "GREEN" and when there is power for the Valve - "RED". These delayed 3-try ignitor boards with 20 second purge cycles and LOCAL flame sense also incorporate an option jumper. Removal of the jumper, for water heater and refrigerator use only, converts the board to instant fire with a one minute purge cycle between the three ignition tries. Propane is an explosive gas!